The Fokker S-11 Instructor is a single engine, two-seat side-by-side primairy trainer with a fixed tailwheel undercarriage. Fokker first began manufacturing planes in Germany in 1912. On 21 July 1919, Anthony H.G. Fokker founded in Amsterdam the "N.V. Nederlandse Vliegtuigfabriek". To commemorate Fokker's thirty years of aircraft manufacture in the Netherlands, they were granted the title "Royal Dutch Aircraft Manufacturer Fokker" on 21 July 1949. Until production ended after Fokker collapsed due to financial problems on 15 March 1996, Fokker have developed and constructed over 100 different types of aircraft, both for military and civil aviation. In 1946, just after World War II, Fokker started design studies for a lowwing primairy trainer with a fixed tailwheel undercarriage. Soon the Luchtstrijdkrachten (LSK) and Frits Diepen participated in the development of the Fokker S-11. On 8 October 1946, Frits Diepen Vliegtuig NV (FDV.NV) ordered 100 aircraft of the type for resale. On 18 December 1947, the prototype of the Fokker S.11 (PH-NBE c/n 6187) flew first, powered by a 190 hp Lycoming O-435-A six-cylinder air-cooled engine. On 12 March 1948, the second prototype of the Fokker S-11 (PH-NBF c/n 6188) flew first. During testing it was found that some aerodynamic changes had to be made to improve the handling of the aircraft. Both prototypes were modified in 1948 and were next to the testflying used as demonstrators until the PH-NBF crashed in Sweden on 16 June 1949. After the loss of the second prototype, the first prototype was broken up and the registration was cancelled on 10 May 1950. The construction of the Fokker S-11 was improved and the aircraft entered production. The LSK ordered 39 aircraft and in 1950 the first Fokker S.11-1 Instructors entered service with the Koninklijke Luchtmacht (former LSK). The Fokker S.11-1 served with the Koninklijke Luchtmacht (Royal Netherlands Air Force) first with the EVO at Woensdrecht AFB. In 1968 the EVO (Elementaire Vlieger Opleiding) moved to Gilze-Rijen AFB. Next to the Royal Netherlands Air Force, the Fokker S.11 was delivered to the air arms of Brazil, Israel and Italy. Until production of the Fokker S-11 in the Netherlands ended in 1953 a total of 101 aircraft were built. Next to the Dutch production, the Fokker S.11 was manufactured under licence by Aermacchi in Italy as the Macchi M.416 and by Fokker Industria Aeronautica SA / Fabrica do Galeao in Brazil. The 1951-built Fokker S-11.1 Instructor c/n 6279 started its career as 'E-36' in service with the Royal Netherlands Air Force. Fokker S-11.1 Instructor c/n 6279 was one of nine aircraft of the type that were sold to the MLD (Marine Luchtvaartdiens) and on 26 January 1970, the aircraft entered service with the Royal Dutch Navy / MLD as 179. All nine MLD' Fokker S-11 aircraft entered service with VSQ 9 (Vliegtuigsquadron 9) at De Kooy. On 28 August 1973, the Fokker S-11 '179' was withdrawn from use by the MLD, stored at the DVM at Gilze-Rijen and offered for sale. On 5 October 1979, the aircraft was registered PH-ACG with A.C. Groeneveld in Amstelveen. On 7 December 1979, the PH-ACG was registered with the Dutch Historical Flight. Fokker S-11 PH-ACG was operated with E-36 titles, but without its Dutch military markings. On 7 January 1983, the Stichting Fokker Four was registered as operator with the Dutch Historical Flight as owner. In September 1994, the aircraft was painted in its former military Royal Netherlands Air Force 'E-36' colours. On 3 April 2007, the Fokker S-11-1 PH-ACG was registered with A.J. Dros, Sassenheim. 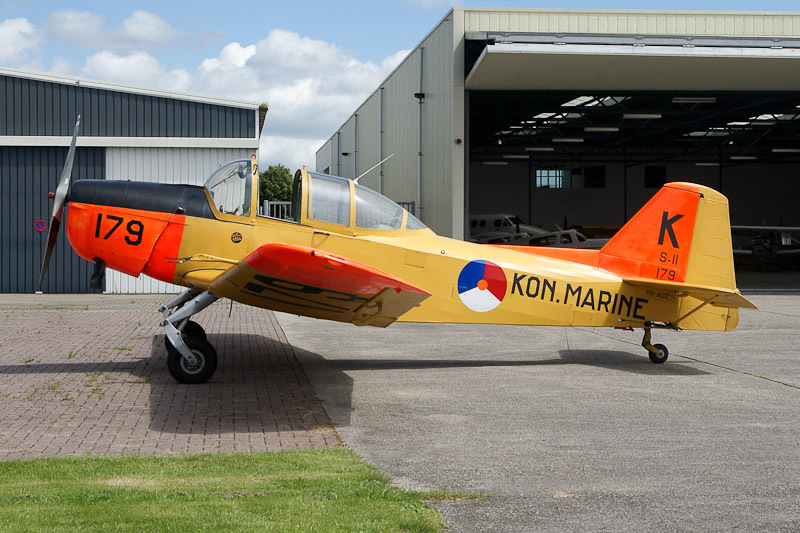 In 2008, the PH-ACG was painted in its former Royal Dutch Navy / MLD '179/K colours'.